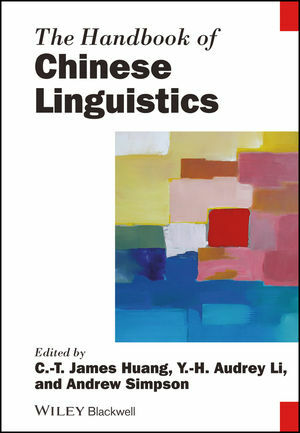 The Handbook of Chinese Linguistics is the first comprehensive introduction to Chinese linguistics from the perspective of modern theoretical and formal linguistics. Containing twenty-five chapters, the book offers a balanced, accessible and thoughtfully organized introduction to some of the most important results of research into Chinese linguistics carried out by theoretical linguists during the last thirty years. Presenting critical overviews of a wide range of major topics, it is the first to meet the great demand for an overview volume on core areas of Chinese linguistics. Authoritative contributions describe and assess the major achievements and controversies of research undertaken in each area, and provide bibliographies for further reading. The contributors refer both to their own work in relevant fields, and objectively present a range of competitor theories and analyses, resulting in a volume that is fully comprehensive in its coverage of theoretical research into Chinese linguistics in recent years. This unique Handbook is suitable both as a primary reader for structured, taught courses on Chinese linguistics at university level, and for individual study by graduates and other professional linguists. C.-T. James Huang is Professor of Linguistics at Harvard University. His research interests lie in natural language syntax, the relationship between syntax and semantics, and parametric syntax with special focus on Chinese and other East Asian languages. He has published articles in a range of journals, including Linguistic Inquiry, Language, and Natural Language, and is the author of Between Syntax and Semantics (2009), The Syntax of Chinese (with Audrey Li and Yafei Li, 2009), and founding co-editor of Journal of East Asian Linguistics. Y.-H. Audrey Li is Professor of Linguistics and East Asian Languages and Cultures at the University of Southern California. She has authored and edited several books, including Essays on the Representational and Derivational Nature of Grammar (with Joseph Aoun, 2003), Functional Structure(s), Form and Interpretation (edited with Andrew Simpson, 2003), and The Syntax of Chinese (with James Huang and Yafei Li, 2009). She has also published in a number of linguistic journals including the Journal of East Asian Linguistics, Language and Linguistic Inquiry. Andrew Simpson is Professor of Linguistics and East Asian Languages and Cultures at the University of Southern California. He is the author of Wh-Movement and the Theory of Feature Checking (2000), and editor of Language and National Identity in Asia (2007), and Language and National Identity in Africa (2008). He has published articles in a number of Linguistic journals, including Linguistic Inquiry, Language, Lingua, and The Journal of East Asian Linguistics. He is also joint general editor of The Journal of East Asian Linguistics.